At least once a week (okay, three times a week), I find myself on the website for my local soup place because I like to know the various soup options at all of their 1,643 locations around me. Once, I walked eight blocks for their tomato bisque because my soup commitment is real. The only problem is, the soup place is taking all of my dollars that I could be spending on shoes! Logically, I know I can make a giant pot of soup for a few bucks pretty quickly, and yet I still find myself on this magical soup site every week, frantically scrolling through their daily menus so I can plan my weekly soup buying. Last week, the soup shop introduced their fall soups and I figured I should just give them my credit card. And when I found out that the theme for this month's Blogger CLUE was autumn, did I think I should make a fall soup? No, because that would make too much sense. Instead I wandered in over to my blog buddy Lora's blog, in hopes of finding a fall dessert because dessert! If you're even remotely in to food blogs you probably already know Lora and her lovely Savoring Italy posts featuring authentic Italian cuisine such as her homemade pappardelle. Be still my heart. And if you don't know Lora, what are you waiting for?!? Go and get to know Lora. As I was scrolling through Lora's blog, I paused on her Pumpkin Bundt Cake and then her Pumpkin Cinnamon Rolls and then her Apple Coffee Cake because my love for seasonal desserts knows no bounds. So there I am, almost nearly super close to 100% settled on a dessert when I bumped in to her Roasted Butternut Squash Soup. The clincher? On the soup page was an ad for shoes. It was obviously a sign from God that if I made this soup, I could stop giving my money to the soup store and use the money to buy shoes because of course! Or, um save that money (in case the Hubster happens to be reading this post). But really, buy more shoes! I made this soup last weekend, when it was still a million degrees in San Francisco and we had our air conditioning on. Luckily, it's always soup weather in my mind and this soup fit the bill! It's fragrant with cumin and chili powder and is perfectly creamy without adding any cream. It's also got a bit of body and tastes a million times better than the butternut squash soup from the carton. I happened to make it with chicken stock because that's what I had on hand, but Lora's recipe calls for vegetable stock which would make this soup perfect for vegetarians and non-vegetarians alike. So go on, make your soup and more importantly, buy your cozy shoes because it's fall, y'all! Peel and cut butternut squash, sweet potato, and carrots into big chunks. Put the vegetables on an oiled baking sheet and bake for about 30 minutes until tender. I broiled them for the last 5 minutes because I love that browned flavor. Remove vegetables from oven. Heat a large pot over medium heat, add 2 Tablespoons of olive oil, the onion, garlic, and sugar and caramelize. Add roasted vegetables and spices and simmer for 30 minutes. 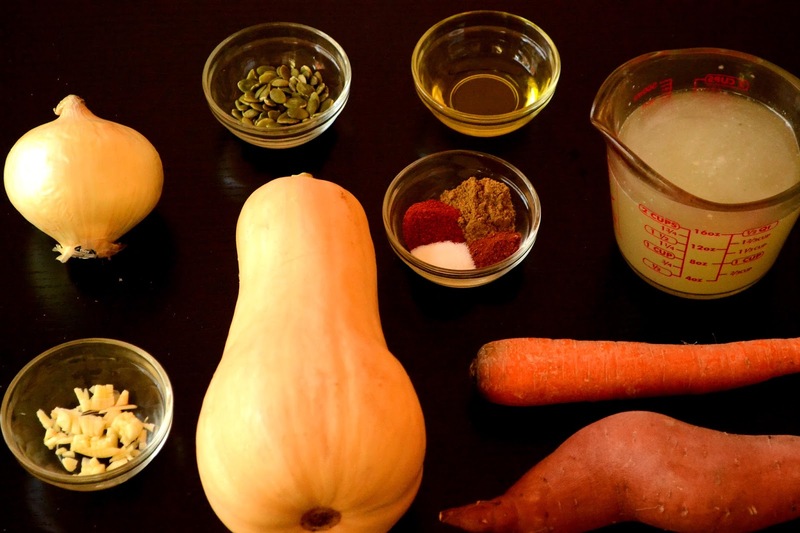 Puree in a blender or with an immersion blender until smooth. Great looking bowl of soup and I love that little garnish of pumpkin seeds. The pumpkin seeds were really good on top! The babies agreed since all they ate were the seeds! What a gorgeous bowl of soup! It would be perfect on this crisp autumn day---what a lovely combination of flavors!! Thanks Liz! Great theme this month, thanks to the organizers! I knew you would understand Shashi! Yea! Another soup!! I'm getting ready to make some chicken noodle soup this afternoon so yeah, I'm all about making my own (though I won't be buying shoes with the money I save). :) You've definitely picked a perfect recipe for fall too ... butternut squash is autumn comfort food! Fantastic theme this month thanks to you fantastic organizers! And I hope you'll post your chicken noodle soup because I loooooove me some soup! Love butternut squash soup. We are soup lovers in this house too but I don't use the money I save making homemade soup on shoes....I spend it all on books LOL. Books!!! Would love to hear about some of your recent favorites. U haven't been doing a lot of reading lately but would love some good recs! LOL - I am glad you settled on this healthy beautiful soup even with all those other tempting recipes! Not that there aren't great soups out there to buy but I always think it's a bit of a rip-off because you're paying mostly for water. : ) And it's always soup season for me, too. It's actually chilly now so I'm constantly thinking about it. I'm going to figure out how much I saved and how many more pairs of shoes I can buy because of it. Thank you! Gah yes! Totally! I refuse to pay for soup water (except like three times a week when I buy soup) ;) Luckily this made a giant batch! Oh no, sorry you were tempted by the shoes ad...but glad it led you to this soup! 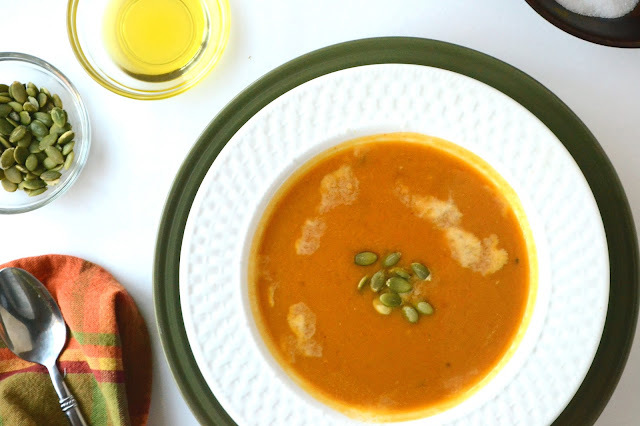 I love butternut squash and pumpkin soups during the cooler fall weeks. Your soup turned out lovely, Azmina! this is one of my favorite soup!!! i love Loras blog. It's now one of my favorites too! So seasonal and perfect!! What a perfect Autumn selection for this month's theme. Looks so tasty. Love your photo! Can't wait to see you in December at Jean's!!! Thanks Lauren! I loved your sweet potatoes too (and the bundt)! It's been so nice to get to know you through CLUE! This is perfect for the fall! I need to try cooking with butternut squash. Oh my gosh Cathleen, I will confess I was totally freaked out by the squash! But after watching a YouTube video (or like five), I felt much better about tackling it and the soup really was worth it! Haha yes to those shoes AND this soup :) I can have soup all the time and wish I had a bowl right now. Looks so creamy and delicious! Love the seasonings in this!